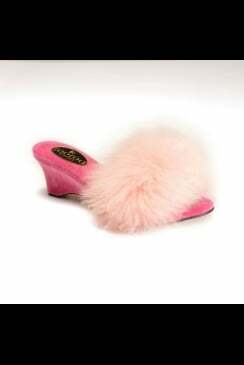 Born out of a passion for detail and comfort these exquisite sheepskin mule slippers by fOOfOO are reminiscent of old Hollywood glamour! 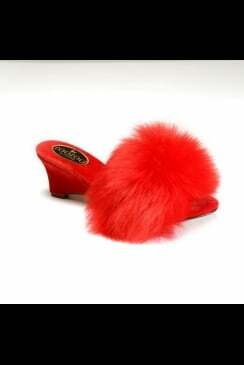 The perfect accessories for your favorite lingerie and nightwear fOO fOO slippers are made from the highest quality and handcrafted vintage style fOOfOO® Slippers are designed with a stylish scooped wedge heel, encased in a luxurious red velvet material and topped with a fluffy sheepskin upper in an array of colours. The British creative designer of fOOfOO® slippers has spent much time and deliberation in developing a beautiful product. Each pair is handcrafted by Portuguese artisans in a family run workshop. Each slipper is carefully created and every detail is scrutinized - from the sourcing of high quality materials to the creation of the fOOfOO® signature sole. The details really do matter!